Welcome to my blog and info page for Out-of-body-experiences (OBEs), Astral Projection, Soul Retrieval Helper Work and Lucid Dreaming. This is a collection of verified Out-Of-Body-Experiences. The persons have verified the facts they could not have known afterwards. In many cases the verification and confirmation of observed and remembered facts was also done by other persons who were observed or „visited“ during the OBE. The first section even contains scientific experiments by scientists in the laboratory. The first experiment was done by a renowned parapsychologist, C.W. Tart, with a woman who is a natural astral projector and recognises a 5-digit number in another room on a shelf. Other lab experiments with induced OBEs are added below, too. A rather special one is done by a nuclear physicist and consciousness researcher, T. Campbell. It's actually a whole experimental sequence done in altered states of consciousness together with another colleague at the Monroe Institute. It can be read in his book "My Big T.O.E." (which can be read free online by the author's consent), but it is without any scientific paper written on it. The relevant text passage is quoted and there will be a link to a google books site. It is recommended to read the whole chapter (online) to get the picture (or purchase the book, it is worth it!). Campbell's example might also be the only one that contains experiences of 'astral planes' other than the "RTZ" (real time zone) which more or less is an energetic version of our physical 3D environment and therefore facilitates real-time observations that can be verified. The verification, however, consists of two adventurers doing a paired trip out into these non-physical realms and confirming it later to each other. It should also be noted that in the vast literature on Astral Projection and OBEs, e.g. in Robert Monroe's and Bruce Moen's books (the latter also with a lot of paired trips in the non-physical), you will find a lot more personal validations. Many more of these kinds of experiments with similar paranormal abilities have been done by parapsychologists on Clairvoyance, Postcognition and - last not least - Remote Viewing. Many CIA experiments in the 70ies and also later experiments at the Stanford university yielded highly compelling results. Furthermore, in Western society many people with experiences do not talk about these things at all (not even in anonymous forums or among friends or family!) due to the societal paradigm which is materialism that declares all spiritual experiences as being 'insane'. Therefore we have to assume much more experiences with validations that we will never know about. For the more private accounts here, links are given to the original websites (mostly open public discussion boards and forums). If the posts / validations, divided by a o--o each, are not linked each one individually the corresponding link can be found in the example with the first link given, as it was in the same post (by the same person). A general note: Verifications - like all qualitative consciousness research of 'psychedelic' or altered states of consciousness - are not always easy to do, which makes it a difficult or even almost impossible task to obtain objective proof in scientific experiment set-ups. A good explanation of why this is so in the case of OBEs can be found HERE by astral projection expert Robert Bruce or HERE by astral projection expert Juergen Ziewe. However, it is possible to get personal validations, as this (still small but growing) collection of online resources will show you. Some cases are stronger some less strong, so this is not about any scientific and 'water-proof' experimentation. Most of this has been done by private persons and thus the accounts are of a more casual and private nature, but compelling and striking nonetheless in many of the cases. Another Page listing a great amount of verified Remote Viewing cases, OBEs during a Near-Death-Experience and verified information retrieved from deceased people during astral projection. Here is just an example page for NDE verifications (one of many). A "Ms. Z" tested in the laboratory. "Miss Z awoke and called out that the target number was 25132. This was correct (with the digits in correct order), but I did not say anything to her at this point; I merely indicated that I had written the number down on the record. I then told her she could go back to sleep, but twenty minutes later I awakened her so that she could get ready to go to work. (...) It should be mentioned that Miss Z had expected me to prop the target number up against the wall on the shelf; actually, I had laid it flat on the shelf, which she correctly perceived. (...) Miss Z's correctly calling a five-digit number (P = 10^-5 [i.e., odds of 1 in 100,000]) was the first strong evidence that her OOB experiences contained a parapsychological element." "One of our first experiments was for Dennis and me to take a trip (experience) in the nonphysical together. Our independent descriptions of what we were experiencing should correlate closely if the experience were real and independent of either of us. From the beginning of our training, we had learned to give real-time descriptions of whatever we experienced. A microphone was suspended from the ceiling above each of our heads. What we said was recorded on tape. Dennis and I could not hear each other because we were in separate soundproof chambers. Dennis and I quickly achieved the appropriate altered state, left our bodies, and met in the nonphysical as planned. It was a long adventure. We went places, saw things, had conversations with each other and with several nonphysical beings we happened to run into the long way. Bob had let us go a long time before he ended the session and called us back. We pulled off our EEG and GSR electrodes and stumbled out of the darkness into the hallway of the lab. In the control room, Bob was waiting for us. After a quick exchange, we knew that his would be a good test because we both had experienced many specific interactions. But were they the same interactions? Bob looked at us deadpan. 'So you two think you were together?' he asked, trying to sound disappointed. We looked at each other and shrugged our shoulders. 'Listen to this!' Bob said emphatically. The tapes, rewound as we disconnected electrodes and climbed out of our chambers, began to roll forward. We sat down and listened. The correlation was astonishing. For almost two hours we sat there with our mouths open, hooting and exclaiming, filling in the details for each other. Bob was now grinning. 'Now that tells you something, doesn't it?' he exclaimed beaming. He was every bit as excited as we were. We repeated that experiment with similar results. It wasn't a phenomenon that depended on the two of us. Nancy Lea and I shared equally astonishing joint experiences. We tried other things as well. We read three and four digit numbers written on a blackboard next to the control room. Somebody would write a random number and we would read it while our bodies lay asleep. Then they would erase it and write another one, and so on and on. We went places - to people's homes - and saw what they were doing, then called them or talked to them the next day to check it out." 18:40 When will Part 2 of MBT be available in German? "During induced OBEs in experimental tests (e.g., Palmer & Lieberman, 1975) subjects have been able to identify remote targets to a statistically significant degree. This might be attributable to the use of ESP, although in a study conducted by one of HJI's students (Smith & Irwin, 1981) a correlation was found between verdicality and independently judged "OBEness"; that is, the more the induced experience ws like a spontaneous OBE the more accurate was the subject's description of a remote target. There is, therefore, some indication that OBEs can be verdical to a degree that mere fantasy could not. Futher research on this point is warranted" (p. 177)." This is from a foreword of his classic book. There are more detailed examples of verifications in his book. S.M. was a skilled RTZ projector. "I have often gone into houses, and noted the things - later going there in the physical, and seeing everything exactly as I saw it in the astral." This is from his first classic book. It is a longer chapter. No direct link is possible, but you can enter "on the evidence in the fall of 1964" and it will bring you to chapter 3 describing the thorough and skeptical verification tests he did. "The incidents may have been simple and unimportant in themselves, but as minute pieces in a mosaic, they were vital. the emerging pattern through the glimpses of the whole was made believable and acceptable to me only through the inclusion of hundreds of such scraps of evidence." This is Robert Monroe about about verifying retrievals. In retrievals, stuck individuals are helped to move on. During this, sometimes information has been gathered from the retrieved persons that has later been verified. This is from his third book. No direct link is possible, but you can go to page 251 (and following) of this online document to find the quoted passage about the Lifeline Program. "Lifeline participants are encouraged to seek as much information as they can from the subjects of their retrievals. By this are meant personal details, such as name, age, address or state or country of origin, date and cause of death (road accident, illness, natural disaster, warfare, and so on), occupation, and any other details that may seem relevant. Communication is generally nonverbal and often by means of a ROTE —a ball of thought. Where the information received is sufficiently full, it is passed later to the Lifeline Research Department, which sets a process of verification or validation in motion. In most instances it has not so far proved possible to obtain enough of this kind of information to make the effort worthwhile; this type of formal questioning is often inappropriate to the circumstances of the retrieval. But on a few occasions enough information has become available for secure verification to be made: a person of that name, age, and place died in that manner at that time. For most participants this does not matter; they are so convinced of the reality of the process that they are not concerned about this kind of checking. The Institute, however, feels that it is important for this to happen, although once twenty or thirty instances have been verified there would seem little purpose in looking for more." This is from the book 'The Mystic Sciences' by M. Waite, as uploaded on Script. No direct link is possible, but you can enter "Thomas Garrett" in the search field and it gets you to page 67 where you find these accounts, as quoted here. "Dr. Thomas Garrett, a therapeutic hypnotist, once had occasion to treat a young man who was in a deeply depressed state over a quarrel with his sweetheart. Dr. Thomas, after placing the young man in a deep trance, planted the suggestion that he would be able to travel astrally to the young lady's college dorm at Wellesley and find out how she really felt about him. After a moment of silence, the young man announced that he was in Wellesley and standing outside the girl's door. Dr. Garrett directed him to 'pass right through the closed door,' which he evidently did, because before long he was announcing in considerable elation that he was watching his girl at her desk writing a letter, and the letter was to him. 'What is she saying?' Dr. Garrett asked. Slowly his patient repeated word for word what the girl was writing in the note; an apology for the cause of their quarrel, and a plea for forgiveness. Dr. Garrett wrote down every word, and when he brought the subject out of trance he gave him a copy of the contents of the letter which he would not actually receive for another day or so. When the letter came, it was exactly as it had been worded earlier!" "An even more spectacular case of hypnotic astral projection is related by Long John Nebel in his book, The psychic World Around Us. Hypnotist John Kolisch brought a 17-year-old youth identified only by the name 'Tommy' to Nebel's apartment and put his subject into a trance. He then, step by step, described an astral journey which Tommy was to make across the foyer, directly through the closed front door, down the hall to the elevator, into the elevator (again without bothering to wait for the door to open!). All this while, of course, the entranced Tommy had not budged from the chair where he sat in his trance. But a smile did cross his face, and he filled his lungs with the 'fresh outdoor air' as the hypnotist had directed. At this point Kolisch turned to Long John and asked if there was any information Tommy could bring back with him as proof that he had made an astral journey. Nebel on the spur of the moment asked him to find out what kind of car was parked third from the fire hydrant in front of the building. The youth promptly answered that it was a 1959, blue, two-door Studebaker Lark with white vinyl seat covers an AAA bumper sticker, and a license plate number 897468. Tommy was brought out of the trance at once and remembered nothing of what happened. Long John and Kolisch immediately rushed to the elevator and down the street to check on the evidence. And there in front, third car from the fire hydrant, was the Studebaker Lark, practically as the boy had described it. He was off one number in the license plate, and the car was more green than blue, a fact that might have been explained by the fact that Tommy was color blind." "As I always say, the only way a person can “prove” experiences to himself or herself is to gain knowledge of an action that is unconnected with themselves. Physical projection, once mastered, is an excellent opportunity to get some. For example, in one RTZ projection I had fairly recently, I was outside and saw a large van making a delivery to the bakery. I popped back to physical, threw on some clothes, walked down the road to the bakery to check and there was the van. This is just one example but once you have done this kind of thing a few times, residual doubts about your experiences will soon be dispelled." "One of the useful aspects of F3 exploration is that you contact people, get their details and try to verify that they used to live in the physical world later. I have managed to make a number of verifications of people I met within Focus 3 of consciousness of my Phasing Model." „When I was a little kid I had OBE experiences all of the time. I used to visit a place called "The Boys Club" for fun in the physical after elementary school. „On 07/13/12 at 12:30 am, my girlfriend had another experience with me being out of body. I felt myself slip out of body, and I consciously hovered a couple of feet above my body. I did this for two minutes while holding this position. I then entered back into my body and my physical body jolted. „my girlfriend set up a gemstone attached to a necklace on the mirror in her bedroom a certain way without letting me know beforehand. I had an obe in front of the mirror recently. I saw it hanging on the mirror. I willed my energy and somehow was able to swing it the other way which caused it to be partially tucked in behind the mirror. „The most convining validation I have experienced yet involved my sister, when I was still living at home. I became lucid in a dream, which caused me to wake up. On waking I discovered I was paralysed and experiencing the vibrations. I rolled out, and for some reason, I decided to try and pull my sister out. I went to her room (in my experience the light was on in her room, but in reality it wasn't) and started pulling at her arm. When I finally got her out, I showed her how to float, and helped her float up to the ceiling (we had our heads sticking through into the loft). The experience wasn't much more than this. I returned to body and checked the clock. „A few years ago I was living in the south of England whilst my parents lived in their house in Leeds in the north. One Saturday morning I AP'd and decided to pay my parents an "astral" visit. So concentrating on their house in Leeds, I soon found myself outside in the street in front of the house. It was a bright morning. Walking up the garden path I passed through the front door and into the hallway in my parents' house, where I discovered my mother watching in utter surprise as I came in through the front door. •What are your thoughts about skeptics and their views? „dream: I get lucid and focus on B (my friend). After a few moments I arrive near a large pond behind a house. B is sitting their tossing rocks in to the water. I call to her and tell her its me. She sees me and calls my name as she stands up, but then disappears. I didn't make it to your room in my projection last night, but I was thinking about your experiment and noticed a light blue object on my brother's dresser. It had five connected vertical open cylinders and little symbols of animals on it. It almost seem to sparkle as though it were made from glass. "I finally did a direct validation!!!! I didn't use playing cards but used random numbers I had written on pieces of paper. Since projection was difficult I cheated and just asked my guide and she showed me the number"
It's not the best verification, but I think it speaks for itself that there was some level of verification there. I know I probably shouldn't be focusing on trying to prove the existence of the NPMR this way, but I find it a fun experiment to play with. „I've had several validations. But the most validating was the one in which my ex showed up in my OBE. He has these experiences also, only his are more progressed. He told me he was going to come and join me sometime. And he did! A few days after he appeared in my OBE, my ex came over to my house and asked me if I had seen him. I told him, "I knew that shadowy figure on the stairs was you!" I had recognized his silhouette----especially that of his hair!My ex even told me that at one time when I flew past him that my and his heads had collided.This had happened when I decided to fly through him instead of past him the second time around.I flew through him from his neck up. This is when he and I collided heads!" „One in particular experience that I could call validation of an astral experience was when I was attending high school. I had left my body and found my conscious awareness at the top of some trees. It was night time and I saw a fire burning below. I could see a definite red glow and smoke was billowing up through the air. Below I saw firemen scurrying about working on putting out the fire. The next day I relayed this experience to my close friend from high school. He was astonished at what I told him and he then told me that there had been a fire at a school mates trailer that night. He said that himself and other volunteer firefighters were there that night, and the scene was very similar to what I had relayed to him. „It was the evening of the 19th of December 2003. I was at home for Christmas, out in my room (in the garage...really quiet and perfect for meditation/OBE practise). Left the body after only about five minutes, rolling out and standing up. Great clarity. Walked through the wall (concrete/glass sensations) and out into the yard. „This OBE was an interesting one because of the aftermath, and you will see what I am talking about at the end. During a regular dream where I was at my childhood home with my sister. I realized that I was dreaming and from that point on I took control and it became an OBE. I told my sister with an exciting tone of voice "We are out of our bodies right now. I'll show you" and then I asked mentally my deceased grandfather to show up. Next moment he is walking through the door of the living room. He was smiling and my sister was looking in shock. Then I called mentally my father who's death my sister suffered greatly. He too walked in the door and at that moment my sister gave a cry and jumped into his arms. After that I told her "Now, we are going to go back in time and experience one of our Christmases when we were kids". I grabbed her hand so we can "teleport" together and I don't loose her and few seconds later we were in the same room, but this time was all decorated for Christmas and on the table there were all kinds of food. The emotions were unbelievable. I cant even start to describe. After that I said to her "Now do you want to fly around, because we can". She hesitated and I sensed that she was a little afraid, so I said "Don't worry, we are going to fly with a car, so you can feel safer". We went outside and infront of our house was parked a blue convertible (I don't know what brand) car. We jumped inside, I gave a command and the car raised into the air. I said to myself "I want to go to a big city at night time". Instantly we are flying over a city with tall sky scrapers with millions of lights. It was breathtaking. At that time I woke up slightly vibrating from the experience, looked at the clock and realized that my sister was awake at that time on the other side of the globe and probably at work. So, I thought that I was going to wait and see if she will mention anything possible a feeling, a thought, etc related to our AP together. So one day later she sends me an email that she had an amazing dream involving seeing our father and her hugging him. Also she mentioned me and her sitting at a table eating lots of food. so i guess you can say it half worked. lol or perhaps one of the people shifted in the 10-20 seconds it took to get to their room." „I get vibrations and am in my 'astral bed' experiencing blindness again. I immediately shout out to my helper(s) to be shown the card I had put 'blind' on a shelf two days ago in front of a little nightlight (for night view should I do the unlikely case of a "real" RTZ projection). First I remain in darkness, maybe holding a helpers hand or not (don't remember exactly) as I do usually when communicating with my helpers and do not see anything. I shout again "The card! Show me the card!" Then I see a card approaching me from far away. The background is still black. There is just this little card, still far away, a little to the right (Btw, it's also to the right in my physical room). I zoom in on it so it gets nearer. 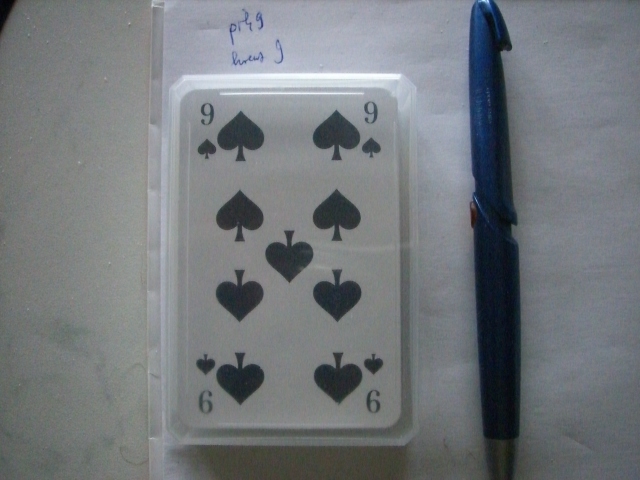 I recognise it and shout it out as an aid for memorising it: "It's a Nine Of Spades!". Then ask for confirmation: "Yes?". A guide answers telepathically (no in-ear-voice this time) "yes". Then vision comes on and I am in my "lightportal" (for those who don't remember my previous entries: it's the name I gave to my childhood bedroom into which I phase quite often, sometimes almost automatically) and the same card is on a shelf next to the bed there visible for me. The guide who answered is a woman. But if I remember correctly it is not Katja (see last post above) this time. I don't know or remember her. I look at the card again and it still is the Nine Of Spades. Then however I seem to lose focus and lucidity. It starts to fluctuate and the black Spades turn also into black Crosses/Clubs, the number unchanged. So it might also have been a Nine Of Clubs. The lack of lucidity also leads me then to defocus from the card validation and engage in a kind of semi-sexual encounter with the guide. But it seems to lead to nowhere and I wake up. Being annoyed at my loss of lucidity and (again) indulgence in my astral sexual urge I expected a failure for the card validation. I did not look up the card immediately but went to sleep after I wrote the result on a piece of paper in case I should forget which card I saw. This morning, I went to the shelf and turned the stack around: Shock! A Nine Of Spades! This is the picture I took this morning. I know this does not prove anything to anyone (except me), it is just a little act of celebration and remembrance of this success for me. I was around 8 or 9. I remember thinking I was too old to have a babysitter,and was mad my parents were going to a party at a neighbor's house, where my aunt was also invited, and who I adored. My older neighbor M. was the babysitter. We read comic books I was not allowed to read usually, and at least felt vindicated for that. So we finally went to sleep. I awoke as I floated away from the bed- and found myself on the main hallway of the house. I then floated through the wall and it was the most amazing feeling. I could feel the concrete wall- all the little pebbles in the concrete and the iron parts of it. I even felt how it tasted, in an amazing way. I found myself floating outside, and seeing the roofs of the houses. I then floated down to the house where the party was, and I entered through the roof. There I could see the party, I could see my parents and my aunt, who was wearing a beautiful dress. I tried to float to her and talk, but she didn't see me. At some point I realized no one could see me and this made me upset. The next morning I told my mom what I saw, and she got really angry thinking I had somehow snuck out of the house. When I described how I got there, she seemed spooked, as I had correctly described how my aunt was dressed and what the other people I knew were wearing. „The second verification I can think of was when I was freshly married- My hubby and I had just moved to our first house and he had a new job (I wasn't working full time yet, IIRC). He had gone to work and I was either sick or something else- what I remember is that I laid down to take a nap, and found myself flying around the beach area. I found myself in a white room, and I could see my husband sitting on a bench with a large box (looked like a giant tackle box) with really shiny metallic pins. He had a pair of tweezers and was rooting through the shiny objects, and putting some of them on a table. When I figured I probably was at his work I kind of snapped out of it. So I woke up and looked for his phone number and called him at work, and asked him what he was doing. „The third verification happened when my son was a toddler. We had been doing some home gardening and had put some seeds in some peat pots, covered them with bags and put them on the top of the fridge for sprouting. „Later we were going to Melbourne to stay with friends. I projected to the airport, where I'd never been. When we went there within the next few days it was familiar and I would announce to my sister what we'd see next. „I've met many astral projectors here (I can think of three at least, maybe four) but none were planned. We just saw each other in projection or dreamspace, and later verified it was really each other." "This happened over 20 years ago when I was a teenager. I was living with my boyfriend and one morning whilst he was at work, I was sleeping in late. Whilst asleep I dreamt (which is what I thought it was for years, but now know it was a projection) that I was in the air (I don't remember flying, I was just there) above him, his two workmates and his boss, all sitting on the tractor. Two of them were on those metal things over the big wheels (one being my bf) and one in the seat. They were all chowing down on lamingtons. I remember they were pink with cream oozing out. Later that day when my boyfriend had finished work I told him about my dream (which he was used to) but his mouth fell open :shock: He told me their boss had brought them lamingtons for morning tea." "Went to the dining room where the card had been placed on the top of a high clock but could,nt see the face of the card. There seemed to be paper on top of it. I must of gone to sleep and the next morning my mind was trying to work out what went wrong.Has everything I,ve experienced just been my imagination?? If I was to guess what card was there what would it be? JACK OF SPADES came twice, but I put this to playing with my imagination. Next day I couldn,t resist it. I climbed on a chair . There was no paper on top of the card. Just the card. JACK OF SPADES." "I've visited people I knew and reported back what they were doing and they were able to verify I was correct." "(...) I ended up at home in my country and saw my sister. (...) Then I was telling her that we were out in the astral and to convince her, I grabbed her waist and we both flew few feet off the ground. Then I told her, “now, you try flying by yourself” and she flew off and disappeared in the sky. And here is something that I have not come across during my OBE life. The next day I was talking to my sister and as I was telling her that in my OBE I found her, she interrupted me and started telling me that during my exact time of OBE, she was taking an afternoon nap (time difference) and she was dreaming that she was flying. (OMG, that was the first time another person involved in my OBEs have recalled an exact experience. Truly amazing.) Then I continued telling her that in fact I was showing her how to fly and sent her off on her own. She could not believe it!!!!!" "I conducted the following test with my brother who lived 800 miles away: “It is worth pointing out that while getting more confident I sought ways of confirming the reality of these experiences. To do this I asked my brother in Germany to pin a word on his wall, which I would read when projecting to the house next time and then confirm it via phone. A few nights went buy and then I succeeded in leaving my body. As I projected into his room I was confused by the large number of notices stuck to his wall. I couldn’t focus clearly on many of them, but one stood out and it read: “4 o’clock, Thursday, take car to MOT”. Although the locality may look very familiar it will almost certainly differ from its physical location. The content of the minds of people are often displayed in the environment (such as my brother’s notes in his diary and in his head were “physically” pinned to the wall). People’s ideas of changing the decor of the house, whether consciously or unconsciously, are often already a reality on the next dimensional level." Many people that I communicate with about the research of OBEs ask if our consciousness survives physical death. I find that we try to put the scientific “prove it to me” hat on and ask for proof, when the skeptic should be proving it for one's self. Being open with a sincere heart and doing the work one's self is the key to success that will unlock that question. I have invested over twenty years to this research and state with confidence we will survive physical death." "This is the second of three similar experiences. In this one, I had brought my girlfriend home from college for the Christmas holidays to her parent's home in the mountains. It was snowing heavily. After dinner, it appeared that I would not be able to get home due to the heavy snowfall. So, her father said I could stay the night but since there were only two bedrooms, I would have to sleep on the couch. I asked if they had a sleeping bag and said I would like to sleep on the floor in front of the fireplace. The parents and my girlfriend and her sister went to bed. I unrolled the sleeping bag and as I did so and was crawling in, I soaked in the beauty of the fireplace and the big white snowflakes floating down outside the picture window. I thought I wish my girlfriend was out here with me. I heard a voice say "why don't you go and ask her?" I said, "why don't you, they can't see you." As I got more and more relaxed, I noticed or felt there was a light on in the hallway and some talking. I disregarded it thinking it was just someone going into the bathroom or something minor. Then, I heard the father say something, like "I'm not afraid of him. I am going to tell him to go home. I felt a whoosh of a yellow light into my head. A few seconds later, the father pretended he was looking for his boots and grabbed my head. I said that was me. He said to go home. I said I can't because of the snow. He said to stay out here. I said I would be right here. The next day at breakfast, I got some strange looks from anger or disgust from her parents, to a look of awe from my girlfriend's little sister. Later, after I got my girlfriend's jeep started by rolling it down a hill and popping the clutch, she said, "how did you do that?" I started to explain what I just did. But she interrupted and said, "no, I meant last night." I said I thought I knew what she was talking about, but what did she see? She said I was a yellow light. I asked if I hurt anyone. She said no, just scared her parents. I asked what I did. She said, first I went to her parents room and then came to the door of her room. I asked if her sister saw me too. She said yes, they both sat up in bed. I asked what happened next. She said, I beckoned her to come with me with my hand. And then, she said her father got up, and my light went back down the hall." „In 1989 my family and I migrated from Italy to Canada. In 1993 my parents gave me as a sweet 16th birthday present a ticket for the summer to my home town of Perugia, Italy. Approx. 2 weeks before my departure I had a dream. I found myself in front of my childhood friend's door. I found it peculiar to be there but in the dream I told myself 'it's just a dream'. I knocked and after a while my best friend came to the door and looked around but didn't see me standing there and as she was closing the door I sneaked inside. As I stood inside their foyer and while trying to get their attention these are the things I saw: first of all it seemed like it was lunch time, all the women of the house were running around trying to set the table, and coming in and out of the kitchen. Why do I say it was lunch time? Because out of own curiosity of the time of day I looked outside toward their balcony and the sun was shining. Then I turned my attention to the house. They had renovated the house. Where there used to be once upon a time my friend's sisters' bedroom was now the kitchen. Beside the kitchen was the new bathroom with granite like tiles from head to toe. And to my left their dining room was still the same but they had changed the arrangement of the dining room table and the TV. As I kept on trying to get their attention and calling out for them I started walking toward the end of the foyer and I opened the door to what used to be their living room which was now my friend's bedroom. And further down the hallway the old bathroom was no longer there and her parent's bedroom had not changed. After again trying without avail to get their attention I finally woke up from my dream. "I had learn the Prayer of Centering while on a retreat at a Trappist monastery the prior. I had been practicing it, but this was the first time I was outdoors engaged in it. I am not sure if the bright sun had something to do with it but I was much deeper in meditation than I had been previously. I then realized that although I was sitting on the chair on the porch, I was also looking down on myself from above. It dawned on me that I was "out". I found that I could move and look around. I saw a bright white tunnel and went toward the light. I could see at the far end "forms" whom I identified as deceased friends and relatives. At the mouth of the tunnel was a bright white form whom I identified as Christ. I started to move toward the tunnel, but the Christ-form told me it was not yet my time. I had the sense that if I did travel down the tunnel I would die, so I turned around. I went back to the porch and looked at myself again. I then heard muted talking inside the building. The doors were shut, but I tried and realized that I could pass through the closed doors. Inside was the house treasurer and Superior talking about the budget. I then left and went back outside. I decided to see how far I could go, so I floated to the top of a tall tree that was along the side of the road about 50' from the porch. I found that I could see far distances very clearly. Looking around from that vantage point I saw two of the other Brothers walking along the beach which was about a quarter of a mile away. I went down and floated behind them as they walked. Although I forget what they were talking about now, at the time I remembered. I then returned to the porch. At this point I knew I had to come out of the meditation. But I had to struggle a great deal to remerge my spirit with my body. It was as if my spirit did not want to go back. Finally, I slowly regained control and came out of the meditation. As I opened my eyes, I saw the two Brothers who were walking along the beach enter the driveway. I asked them if they were walking on the beach talking about what they were talking about. They said yes, and was wondering how I knew that. I then went inside and found the treasurer and asked him if he was talking to the Superior about the budget in the room next to the rear porch. He confirmed this and was upset that I was listening in to their conversation. Because of the struggle I had to remerge myself frightened me somewhat, I did not attempt that sort of meditation for a number of years." "Lying in bed at night. Felt strange feeling of wanting to float which scared the hell out of me. Then I said, as a researcher, lets see what happens if I let it go. I floated to the ceiling, saw my wife sleeping and my body. I left the house, floated above all the cities till I got to a woman friend's house. No feeling of cold, noise and definitely not a dream. Stood at the door and thought of opening it when it dawned on me that I could walk right through the door which I did. In the living room was the mother and father and the woman all watching TV. No sound just sight. She was drinking a beer and laughing with family. I turned and left, floating the 50 some miles back home in a matter of seconds. At times I was afraid I would not get back to my body, strange feelings. Then I sat on my body and felt myself going into my body and the floating went away. The next day after getting to the work place where the woman and I worked, I asked her; ‘How was the beer you had last night’? She about fell on the floor and looked like I had shot her. She asked how did you know? I proceeded to tell her where the family was sitting and watching a funny show and her laughing but did not tell her how I knew as I wanted her comment. She said yes and that was the first time in a year and a half that she had drunk a beer. I then told her of my experience. Two more times this happened and when I had that feeling I willed it to come on faster and it did. The woman verified what I told her. The second time I asked her to explain what she was doing at a certain time and she proceeded to tell me that she was getting a shower and had the feeling of a presence for a brief time. I then told her I came to visit her again at her apartment to which she had moved since the first experience. I then handed her a written account of what I saw when the out of body experience happened. She had to sit down while reading it as she was really flabbergasted at what I saw. I did get in the shower with her so that explains her ‘presence feeling.’"
"I was in college at New York City Tech. I went to the library to take a nap in between classes. I was about to fall asleep and thought I might look like a bum just sleeping there. I grabbed a book from the shelf and put it directly in front of me open. I put my head down on the table and began to feel the relaxation and peace. I knew that I was about to have an OBE and decided to let it happen. I floated up and was looking at the people sitting on the other side of the reading booths. I then looked down and saw the book. My first thought was that it would be so cool if I could read while sleeping. I started reading the open pages and when I tried to turn to the next pages I wasn't able to. I thought to myself that it made sense and that I shouldn't be able to do that since it could freak some people out. I then decided that I should at least memorize that last few words of the page and prove to myself that I wasn't dreaming. So I did, stated to force myself out of the trance while repeating three words. I woke up still saying the words and looked at the page to find out that the words matched. I then read the pages showing and realized that I had already read them. This is my proof to myself, really never cared if anyone believes me." "I was a mule packer working at the South Rim of the Grand Canyon, transporting food and supplies on mules to Phantom Ranch, located at the bottom of the Canyon. The work was good, but physically demanding. By bedtime I was tired. On this particular evening, I laid down in bed with my wife. I was on my back with my right arm raised above me and under my pillow and head. I thought to myself " I can't go to sleep in this position or I will have a crippled right arm in the morning. I realized that I could not feel my right arm at all. I had not been in bed two minutes yet! I then realized that I could not feel any part of my body. No arms, No legs. I could not feel the bed, the covers, my head on the pillow, nothing! That is when I started feeling that sinking floating feeling. I had felt it before. It was neat, I always liked it. The next thing I know is that I am out of my body, outside, somewhere. it was dark, night. I did not know where I was, but I knew I was not in my body. I even said to myself, "hey, I'm out here cruisin' around" I was floating in the night. I then saw what appeared to be a light colored trail/road/pathway. I was not sure what it was. I floated down to take a look at it. I was earthen. I tried to take a step and walk on it. I had no foot, or the foot I thought I had could make no purchase with this ground. This surprised me and I ascended back up in the air. I still knew I was out of my body. I then floated directly over some multi colored lights that were spaced apart. I wondered what town I was over. The lights were green, yellow, amber, red, and not in any set pattern. I had to be a small town I thought. I then thought " Well I'm out here. Lets go someplace. I didn't know where to go. I then decided to go see my ex wife. I chose this because I thought that would be far away I guess. I didn't really care if I saw her on not. I was troubled. I did not know how to go there, or even where it was. I did not know how to make myself go somewhere! The next second I saw a golden (I don't know what to call it) connection emitting from a spot in my forehead, curving and bending through space and connecting me with my body. I quickly flew through space (what a ride) and almost slammed back in my body. Except I didn't slam onto my body. My re-entry was cushioned at the last instant. The next day I had to take more supplies down in to the Canyon, (my job) I thought about this experience all morning. Did it really happen? I knew it did. I knew it wasn't a dream. I had not even gone to sleep when it happened. Then it happened. I was in the Red and Whites, steep switchbacks in the Kiabab Trail. I could look down on the trail as it crossed the plateau. I realized THAT was the white thing I tried to walk on last night. I was looking at from a much different view but that was it. The trail went across a white limestone on the plateau. I could never see it the way I saw it last night unless I flew over it. I entered the inner canyon and on to Phantom Ranch. As I rode through the Phantom Ranch camp ground it was about 7:30 AM. I saw all these tents that campers had erected during the night. Red, yellow, green. I then saw a young man exiting his tent. He had a candle holder in his hand. I noticed another tent had one hanging inside it. I realized that these were the lights in the town that I had drifted over last night. The time I had gone to bed would have been the time people were getting in their tents and preparing for bed and had lights on in their tents. That is it. I would like to do this on command." "one night, just like the night before, i was drifting off to sleep in my bed. this was ten years later and my family had moved to a new home since then. i remember as i was falling asleep that i had this really heavy feeling about myself; and almost simultaneously as i felt this heaviness, i felt weightless. i would have to say that that describes how i felt physically throughout the entire experience. as this feeling came over me, again i could not move or speak. i started to feel as if i was floating off of my bed just as when i was eight years old. but this time, i began to start moving against my own will and i could not control where i was moving either. it wasn't a violent movement, it was smooth and peaceful. but like i said, i had no control as to where i went. i remember that i started floating down the stairs from my bedroom loft. once i was downstairs in the sitting area of my bedroom i did a quick circle around the room and proceeded to my brother's room next door to mine. i floated above the bunk beds and just sort of looked at them. i then left the room and floated through the kitchen down the hallway into my mother's room. i saw her sleeping in bed with the tv still on, and i remember david letterman being on. as soon as this all had started i was back in bed. once again i was frightened. this time, i was really shaking so i went down stairs to tell my mom. i got into her room and eerily there is my mother asleep in bed with the tv still on and david letterman on tv." I was in trouble as a youth because of a very difficult childhood, because of this I was in a youth offenders institute. I was alone in the cell and having a short nap on the bottom bunk-bed. I suddenly felt wide awake and got to my feet. I had a feeling of well being and normality. I had no sense of the steel cell door being locked shut, which it actually was at the time, and I just casually walked out into the corridor. I then walked along the corridor to the main landing and began descending the stairs to the lower levels. Visiting Officer: "I have come for George, he has a visit." Wing Officer: "Its the first time he's had a visit. Who is it?" Visiting Officer: "His step mother." Wing Officer: "Well you had better unlock him then we can get him signed out". He's in No. 44 on the third landing. The Wing Officer began climbing the stairs beneath me. At this point I thought two things. First, that I was actually getting an unexpected visit for the first time, and from my step mother who I didn't get on with very well, this was unusual. Secondly, that I had better get back to my cell or they would think I was escaping. I hurried back up the stairs and along the corridor to my cell. As I entered I was shocked to see my body lying asleep on the bottom bunk! I entered my body with a sudden jerk and sat up so suddenly that I banged my head on the top bunk. Still smarting from the knock I sat rubbing my head when I heard footsteps approaching along the corridor. I knew who it was! The door was unlocked, and the Wing Officer who I just seen and heard half entered, and told me to get ready and that I had a visit. I am absolutely certain in every way that I had left my body and that there was nothing unusual or frightening about the experience, apart from when I saw my body sleeping. I am also certain because of what I had heard and seen, which otherwise would have been quite impossible. I really don't sleep through the night because of incontinence, and got up to go to the bathroom around 2 A.M. As I got out of bed, and started walking to the bathroom, I noticed something in my bed. I stopped and looked, and my body was still lying asleep in bed, next to my wife. I was awake, and knew I wasn't asleep, but I could still see my body lying in bed. I stood frozen next to myself, not knowing what to do. I called for my wife, and she responded, telling me to leave her alone she was sleeping. I asked her to shake me to rouse me and wake me up. She said, obviously you're awake if we're talking. I stood there looking at myself, knowing I wasn't dreaming, and the fact that I had just gotten a response from my wife reassured me that I was awake. I have sleep apnea, and often mess with my mask while asleep according to my wife. While I stood there, I watched myself adjust my mask and turn over to reposition myself. I could hear my teeth grinding, and watched myself put my arm over my wife's side to hold her. This whole scene was very real, and I know I wasn't sleeping. I wasn't worried or scared at the time, I was actually very comfortable with what was going on. I stood there and watched myself sleep for some time, then finally decided to touch myself to see if I would wake up. When I reached to put my hand on my shoulder, I woke up before I actually touched myself. When the sleeping me woke up, I was startled. My wife felt me move, and already stirring because I had called for her, she said would you just go to sleep and leave me alone. At that point, I realized I was within my body, and no longer watching. The next morning, my wife expressed frustration that I had called to her and woke her up, and said that I was loud and seemed irritated myself, almost worried. I told her what happened and she said I was dreaming, and it just felt real. I know this was not a dream, I was standing next to our bed, and called out her name, and she woke up and responded to me. She remembered the conversation, however short it may have been, and remembered me jumping, startled as I entered my body again. "I had brain surgery on 2/24 for treatment of a large intraventricular brain cyst and was under anesthesia for 2 to 3 hours. I had no memory of the experience until the next morning. The only real "sleep" I had during my 5 days of hospitalization was during the surgery. Being in neuro ICU the night following the surgery, I did not sleep at all. The following morning I saw various scenes in my head when I closed my eyes. The first one was a close up view of coming out from between my breasts. I opened my eyes not sure why I had that view! The next time I closed my eyes I had a vision of actually entering my brain, what looked like creamy peach color of the brain tissue, and the contours of the brain. I saw the jagged opening of the cyst and actually entering the opening and seeing the perfectly round hole the surgeon made in the cyst! I also saw the pearly blue color of the cyst itself. I drew a picture, as best I could, of what I saw and the surgeon said it was "pretty accurate". He also chuckled when I mentioned the perfectly round hole he made and he verified that." "It was the mid- afternoon, and I had laid down on the couch to relax and watch some TV. I felt myself dozing off, and decided to get up and get some housework done before I fell fully asleep. I opened my eyes, and tried to sit up. I was able to do so, but it was extremely difficult, like my legs weighed a ton. After sitting up on the edge of the couch, I sat there for a second and focused on what was on the TV (Maury Povich) I was getting ready to stand up, and looked at the end of the couch and saw that my feet were still there, then looked at the other end and saw the rest of me still sleeping. I noticed some catsup on my sweatshirt that I was wearing that I was not aware of before I laid down. I immediately got scared and was afraid that I had somehow died in my sleep, and instinctively laid back down. I laid there for a few moments with my eyes closed, then got up. My body was no longer on the couch, and I was awake. It reminded me of being a child, and memories of 'flying' down the stairs and spying on my parents came to mind. I believe that this is not the first time that this has happened. After thinking about the incident for a few moments, I was no longer afraid and tried to lay back down, but was unsuccessful. This has not happened to me since. Note: the catsup stain was INDEED there and I realized it after waking, this validated the incident for me." "Just after waking, I was lying in bed in the morning. I began to meditate, since I felt my mind was clear. I heard an increasingly loud buzzing in my ears and the buzzing morphed into a vibration over my entire body. I felt myself separating from my body, I glaced down and saw that I was now had bright lemon yellow body. The dresser mirror was near but I was afraid to look into it. I boobed around a while near the ceiling, then my body knew to assume a sort of swimming position with arms at my side and I was able to "swim" toward the bedroom wall. I found, however, I wasn't able to penetrate the walls, they felt solid. The long window, however, was quite easy to penetrate, I felt the pressure of the glass as I passed through it. I was anxious to prove to myself that this was a valid experience, so I looked for objects they I could check on in the physical state. Once out the window, I headed for a large tree at the side of the yard. I examined it closely in every detail, but saw nothing unusual. I spotted some broken pieces of a clay pot in the yard then glided back into my bedroom. I attempted to turn on the light switch. Although I could move the switch to "on" and hear it, the light failed to respond. I then felt a pull at the bottom of my spine which I couldn't resist even though I wanted to stay out of my body. I went back into my body head first and had no after effects. I later went into the yard and the pieces of pot were there as seen in the OOB. I've found that OOBs, for me, require gathering a type of energy that can only be stored via meditation where certain breathing and shutting out of thoughts are essential. I've experienced OOBs where other people/animals and the past and future were involved, they have all been exhilarating and wonderful adventures, nothing negative has ever occurred so far." "I went out of body one morning, went outside my house and saw the postman walking towards my house with a parcel, I returned immediately went downstairs and he knocked on the door, he had a parcel for me. I was smiling like Cheshire Cat, I bet he thought I was a little weird lol. Validation is great fun." "I saw a small plane while flying in an out-of-body state, and flew around the plane observing it. When I awoke, I heard a small plane, and looked out my window to see what appeared to be the same plane flying over my home. While obe I visited my children who were living with my ex-wife at a location on the other side of town; and the next day verified the events that happened and what my ex-wife was wearing with her the next day." "I know time can be transcended because I have done so on many occasions. But where is the proof? I wanted to prove, if not just to myself, that astral projection was authentic. In order to do this, I decided that winning some form of a lottery, which would be undeniable proof to me, would be in order. My projections basically happen on the weekends when I can sleep in and induce the groggy state. From this state, my attachment to my body is weakened and I can bring on the vibrations more easily when focusing on the third eye. It was snowing and I decided not to go to work. I decided that day that I would try and win the lottery instead (sounds crazy, I know!) I induced the vibrations somewhat easily and left my body. I then asked to go to the future and "see" the lottery numbers. I started looking for news papers so I could read them as this sounded like the intelligent thing to do. I mean, where else would I find them? I finally found a newspaper and was bending down to look at the numbers for the six million dollar lottery when I was abruptly brought back to my body by an interruption. This did not stop me. Because my body's attachment was very lose that morning, I decided to keep trying. I was brought back by various noises and disturbances until my fifth departure. At this point, I was pretty well fed up with the obstacles and didn't even bother for a newspaper. I simply WILLED myself to see the numbers (as I tell people, will power is of paramount importance). I demanded that I see the numbers! Up popped three very clear balls and I thanked my higher self and forced myself awake before I forgot them. Of course, I played them and won. They were the correct numbers, in the correct order on the correct day. This has been pretty much all the proof I have needed that time can be transcended." "One time a good friend of mine asked me if I’d ever sought out the lottery numbers while lucid dreaming. That had never occurred to me and I asked him if he had. He said, “Oh yeah,” and he told me what happened. He said he became consciously aware and that he asked for the numbers of the MegaLotto or whatever it was called in his state, to appear when he opened up something. So he opened up a book or something, and he saw six sets of two numbers. And during the lucid dream he was really excited and he started to memorize them as quickly as he could. So there’s the first number, 26 and the next number is 3 and the next number is 17. And it goes on and on. He said he was really working hard to memorize the set of six two-digit numbers. When he woke up from the lucid dream he immediately reached for his dream journal and began writing them down as quickly as possible. He says he got the first three exactly right but from then on his memory failed him. He just couldn’t recall the exact order. So a week later when the MegaLotto happened, he said he got the first three exactly right but then the other ones, the order had been goofed up. He’d transposed the numbers as anyone might." Another way to prove the veracity of OBEs to oneself is to produce 'raps' or any form of telekinesis in one's own room while in sleep paralysis. This has been accomplished amongst others by Sylvan Muldoon, who wrote about it in his book "The Projection Of The Astral Body". Today, many assume it is the Etheric (1st) Body instead which only emanates the second (Astral) body later on. The Etheric body itself cannot move far from the physical body, but it can do so for a few metres and produce these effects. "In fact I have produced "raps" myself while in this state. I recall very distinctly waking one morning, and finding myself minus my motivity! I reasoned within myself thus: If my motivity is extending outside my body, and I am now conscious, why cannot I will that rap be produced? And I did will with determination that a rap should come on the dresser. The rap was produced! (...) As to moving objects when the astral body itself is projected on the end of the line of force, under certain conditions this can be done, and we shall discuss this later. For the moment, the point I wish to emphasize is this: Motivity can "shift" across the astral body, just as sensitivity can." "[T]elekinesis can be done. If you are proficient at projection then try this. First awakening seconds still not physically aware, create a bond (silver cord) from yourself to say handles on a cabinet. Make sure it is not broken in its length. It should find its own way to the location but it is somewhat erratic in shape. Intend the end of this bond from you to enlarge at the end and with it flap the handles upward, a pattern of raps is ideal. It has a feel to it and you know it's there, also the given purpose you intend it to perform. Then awaken yourself as fast as you can and sit up listening. Within a few seconds the pattern of raps appears and you may jump out of your skin. It needs to be controlled carefully as any fear and things like very heavy cupboards drag themselves around devastating the flooring." I have moved objects during etheric projections. This is my recommend way to prove OBE's and the rtz are real. If you have difficulties in figuring out how to move objects, you can practice on a psi or chi wheel. There are some good youtube videos showing how. Once you get good on the psi or chi wheel, then you can start practicing moving objects during etheric projections. In my opinion, etheric projections are about energy. Relying on the visual sense may lead to reality fluctuations. I have moved objects under different etheric states. I'll give one example of me actually moving an object from each etheric state. 1) One etheric state is by expanding your etheric body while it is still in the physical body. This would be an etheric ballooning expansion which makes contact with an object to move it. This has to be done relatively close to the physical body, since the etheric body is technically still attached to the physical body, but it has expanded to make contact with the object. The most amazing example of this etheric state is when I was laying in bed on my back and knocked a curtain down off its rail. This scared me a lot, until I realized what I did. I inspected the curtain afterwards to make sure it was a valid experiment. The curtain came down at the exact same moment I willed my etheric energy towards it. 2) The second etheric state is by actually separating your etheric body from your physical body and moving your etheric body to the object. There is no etheric ballooning effect with this type since there is an actual separation of the etheric body from the physical body. The most amazing example of this etheric state is when I knocked the toilet bowl cleaner handle apparatus off my shower wall frame. I put it here to allow it to dry before I would store it away. This one I had to pull in etheric matter from the environment to make my separated etheric body denser to allow myself to be able to knock it down. After I knocked it down, I went straight back to my body to confirm this experience was successful."